It’s difficult to walk on stilts. It’s difficult to walk on stilts on cobblestones. It’s difficult to walk on stilts when it’s a bright day, and you’re wearing a floor-length (even in stilts) heavy tartan coat, and you’re anxious about falling off your stilts, and the sweat is making your clown make-up run into your eyes. It’s difficult to walk on stilts when you can’t wipe the clown make-up from your eyes because your hands are busy beating a drum strapped to your stomach, in time with which you and all the other stilt-walkers are supposed to walk on stilts. A bare-chested dude is leaning out of a third floor window into the street to watch you, his matted rocker’s hair caught in the wind like some sort of equal-opportunities Rapunzel. A girl holding a beautiful bunch of flowers shouts up to him, and he leans further out of the window to Juliet some words down to her. This is a party, a celebration, an accident waiting to happen. This is the first day of Spring. 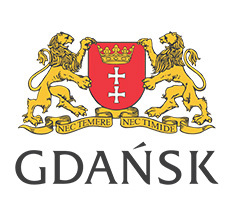 This is Gdańsk. We’re here as part of the Versopolis project, which brings lucky poets together to read at festivals across Europe, to have their work translated in beautiful booklets, to learn from one another’s approaches to writing. The poets I am working with are Paula Bozalongo from Spain, Goran Colakhodžić from Croatia, Veronika Dintinjana from Slovenia and Gjoko Zdraveski from Macedonia. Wonderfully talented writers and wonderful people. On the first evening, there is a brief reading by all of the poets at the festival. A beautiful cacophony of voices. D.A. Powell, the great American, is here, in readings, in discussions, on a table across from me at breakfast, and his events are particularly enthralling. What’s immediately obvious is the warmth of the audiences in Gdańsk, the sense of a real poetic community and of visitors being welcomed into that community as co-conspirators. This is a place that really loves poetry. The second day is for events at the university. It’s there I meet my translator, Maciej Świerkocki. He writes for film and television, has translated Kerouac and Dylan Thomas, and is currently working on the second version of Ulysses in Polish. It is an enormous and unbelievable honour to think that someone would spend time really grappling with my scribblings, thinking carefully how to re-create their sound patterns, their forms, their line breaks, and convey these to a completely different audience. I’m particularly enthralled by his translation of ‘hippo peepshow’ as ‘Hipcio pipcio’ (pronounced ‘heepshow peepshow,’ a wonderfully joyous phrase). I’ll never be able to thank him enough for his great generosity with my poems. 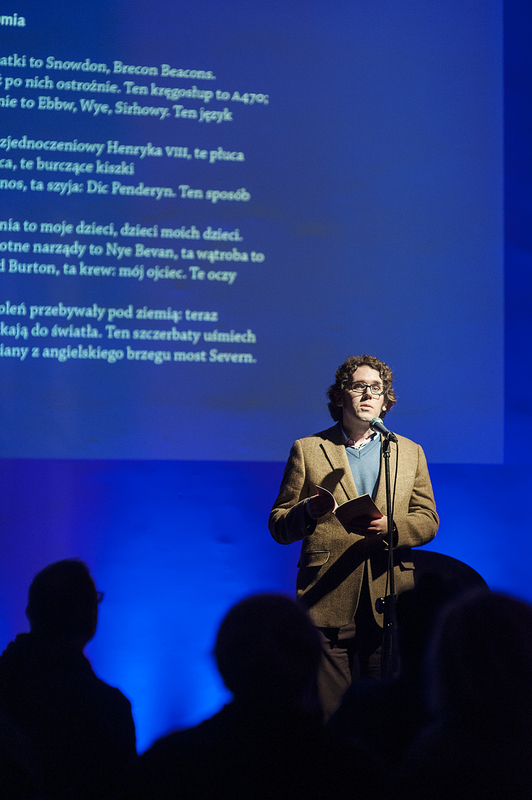 Then there is Piotr Mielcarek, a phenomenon of a person, a friend to poets, the sort of person every poetry festival, every poet needs. He guides us and feeds and waters us, is ever-enthusiastic, patient and cheerful, loves writing, and knows more about us and our poems than we do ourselves. 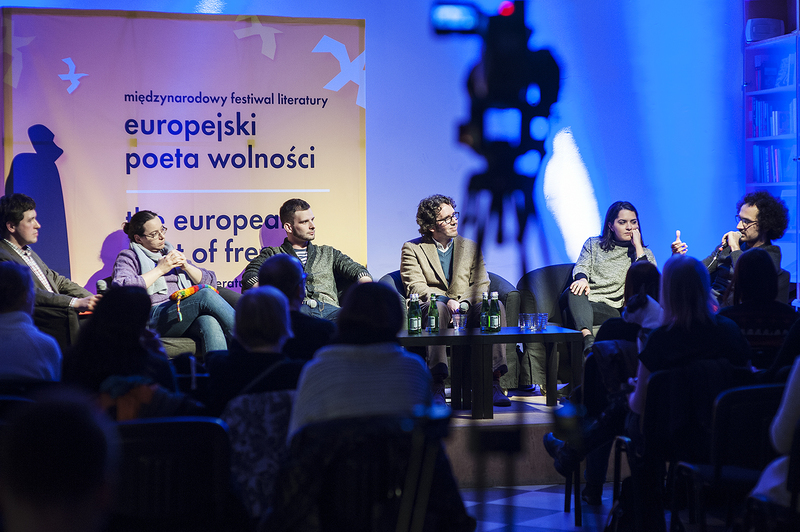 On the last night of the festival is the award ceremony for the European Poet of Freedom, who this year is Ana Blandiana of Romania. It’s an incredible evening, complete with film and dance interpretations of each poet’s work, a live band, and intricate costumes in keeping with the bird motif that features throughout the festival. Again, one is left with the impression that this is a place which values poetry so much, which really knows how to treat poets. 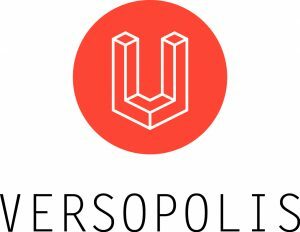 The only downside of the experience is that there isn’t enough time to work with the other Versopolis poets, but this is what the internet is for, to deepen those connections, to form sustained projects. Goran will be performing this summer at the Ledbury Poetry Festival, and the work of all four of these wonderful writers should be well-known in the UK. One question I was asked a number of times during the weekend was whether Gdańsk had inspired some new poems, so I’ll finish this blog, with deep gratitude to everyone in Gdańsk and Ledbury and at Versopolis, with the ending of a new poem, which aims to take one of my default writing strategies, the look-out-the-window-and-write-down-what-you-see approach, and apply it to this new environment. Who knows, maybe one day I’ll be back in Gdańsk, reading this poem. If I am, of course, I’ll have to, at the same time, be doing what the wonderful people at this festival constantly made me feel I was doing. Walking on stilts. I need to hold this city in my hand. Jonathan Edwards. First collection, My Family and Other Superheroes (Seren) won the prestigious Costa Poetry Award 2014 and the Wales Book of the Year People’s Choice Award. It was shortlisted for the Fenton Aldeburgh First Collection Prize. His poems have won prizes in the Cardiff International Poetry Competition, the Ledbury Festival International Poetry Competition and the Basil Bunting Award, and appeared in magazines including Poetry Review, New Welsh Review, Poetry Wales and The North. He works as a teacher.